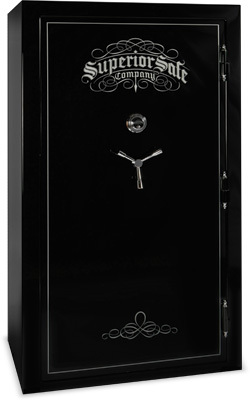 Unlike others of its class, the Encore Series safes have unprecedented features. The five-size series offers a Diamond Embedded Armor-Plate, active bolts on all four sides, and three levels of fire protection on the top and two on the sides. The Encore is a classic edition, more than qualified to keep your collections safe. E-45 40"×721⁄4"×26½" 12 ga. 29" 45 CF 950 lbs 16–1" 5⁄16" 13⁄8"
E-31 37"×601⁄4"×22½" 12 ga. 25" 31 CF 700 lbs 12–1" 5⁄16" 13⁄8"
E-22 30"×601⁄4"×21" 12 ga. 23 1⁄2" 22 CF 525 lbs 12–1" 5⁄16" 13⁄8"
E-17 24"×601⁄2"×21" 12 ga. 23 1⁄2" 19 CF 450 lbs 12–1" 5⁄18" 13⁄8"